When, in 1929, the composer Alexander Glazunov conducted a concert in Eastbourne, a Daily Express journalist graphically described him as having the appearance of a “wealthy retired tea planter”. In fact, the composer/conductor was lucky that the reference was merely to tea - because, for several decades by then, he had had a well-documented preference for strong alcohol in large quantities. Thus, more than three decades earlier in 1897, Natalia Satina had famously suggested that the disastrous premiere of her fiancée Sergei Rachmaninoff’s first symphony had been the result of rather too many early evening snifters on Glazunov’s part before he had mounted the rostrum to conduct it. But it is easy, on the other hand, to see how, even if he had been sober, Glazunov, who in the mid-1890s was composing attractive but conventional works such as his sixth symphony, might well have found himself out of sympathy with the much richer, more complex and often turbulent musical idiom of the (slightly) younger composer’s first. Since its reconstruction from rediscovered orchestral parts in the 1940s, the long-lost Rachmaninoff no.1 has been increasingly recognised as a major work. Nevertheless - as here - it still tends to appear on disc as part of a wider-ranging Rachmaninoff cycle and stand-alone recordings tend to be few and far between. I suspect the explanation is that A&R men worry that potential buyers will be frightened off this still relatively unfamiliar work unless they have first sampled the same conductor’s account of the far more popular second symphony. But here is one occasion, at least, where they need not have worried at all, for this performance is quite strong enough to stand on its own two feet and to face down almost any competition. In the first movement, an even more portentous and glowering opening than usual immediately demonstrates the orchestra’s gutsy, raw and entirely appropriate sound. Even in the most congested passages - of which there are many - Pavel Kogan demonstrates his ability to maintain a fine orchestral balance. Plenty of exquisite woodwind detail, often swamped in other accounts, comes beautifully through and, similarly, the vigorous tintinnabulation in the “orthodox church bells” passage (think Rimsky’s Russian Easter festival overture) doesn’t obscure or distract attention from what the rest of the players are doing. The performance is a consistently effective one, whether in the beautifully projected quieter “yearning” passages (from, for instance, 2:43 to 5:02) or in the more full-bloodedly passionate ones that make me wish I had heard these artists’ earlier account of the Rachmaninoff second symphony. Kogan’s fine dynamic control is intelligently applied throughout, not just to enhance the drama of the music but also to clarify and elucidate the textures of this busy score. Kogan drives the second movement along very excitingly and, right from the very opening, revels in the full, deep and rich tones that the orchestra produces, especially in its lower registers. The very fine woodwinds and agile Moscow strings are shown to particular advantage and the conductor uses the widest dynamic range to draw attention or add emphasis to some exquisite passages that are skated over in less thoughtful accounts. Even more impressive, though, is the andante third movement - the high point, for me, of this recording. Once again, Kogan’s thoughtful and painstaking approach forces one to listen anew to the details of the score. The richly-textured opening pages convey the most aching and intense sense of melancholy and desolation, before an especially powerful and ominous orchestral introduction at 3:37. The playing throughout this movement is very fine indeed and its final section - capped at the climax with just a hint of that old-style raucous Soviet brass that you either love or loath - is exceptional moving. Rachmaninoff’s thrilling finale - forever remembered by UK TV viewers of a certain age as providing the theme music for BBC TV’s Panorama - does not disappoint. There is plenty, of course, for those powerfully raw lower strings to do, but once again Kogan lets as much light into the score as possible. For once I found a couple of issues with the orchestral balance: some characterful writing for pizzicato violins that gives extra lift to the melody of first the woodwinds and then the strings (from about 4:00 to about 5:18) is underpowered and the climatic stroke on the tam-tam (at 10:41) is not, perhaps, as awe-inspiring as I personally like to hear it. As that remark suggests, though, those are personal quibbles which may not trouble other listeners at all. The movement’s final tragic peroration is very powerfully delivered and as utterly moving and emotionally cathartic as it ought to be. Isle of the Dead makes a substantial filler, not only in terms of the clock but also in emotional heft - although I’d suggest that there is room to question booklet writer James Murray’s emphatic assertion that “nowhere else does this most emotive of composers exhibit his innermost feelings so graphically”. 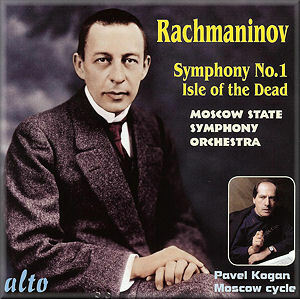 This flowing, purposeful account keeps its end in sight throughout - it does, after all, depict a physical journey - and occupies a position somewhere between Rachmaninoff himself - whose ferryman must have taken a speedboat to the island to get the masses ranks of the Philadelphia Orchestra there in just 18:05 in a 1929 account (see Vista Vera and Pearl) - and Evgeny Svetlanov who, distracted on his traversal of the waters to look very intensely at the view, takes a whopping 25:00. Kogan builds the musical ebb and flow very successfully to an effective and most dramatic climax at 14:37 and his skilful musicians play their hearts out for him. This is altogether a most impressive account. That makes it all the odder that the recordings of both works have taken nearly twenty years to appear on disc; the booklet makes it clear that these are first issues. I would hazard a guess that the collapse in funding for the previously heavily subsidised arts in post-communist Russia may have had something to do with it, but the booklet notes throw no light on the mystery. Observant readers will have noticed that I have spelled the composer’s name as Rachmaninoff whereas Alto’s presentation prefers Rachmaninov. It is certainly true that the name in Cyrillic lettering ends in the Russian letter “b” which is usually transliterated into a “v” in the English language. But the composer himself chose to adopt the French transliteration of his name that uses a final “ff” - as can be seen in his personal signature, on his application for US citizenship and even on his gravestone. The “v” variant appears to have originated only in the 1960s. I have thus followed the invariable practice of Rachmaninoff himself.